As you can see, the bridge stayed mostly intact. 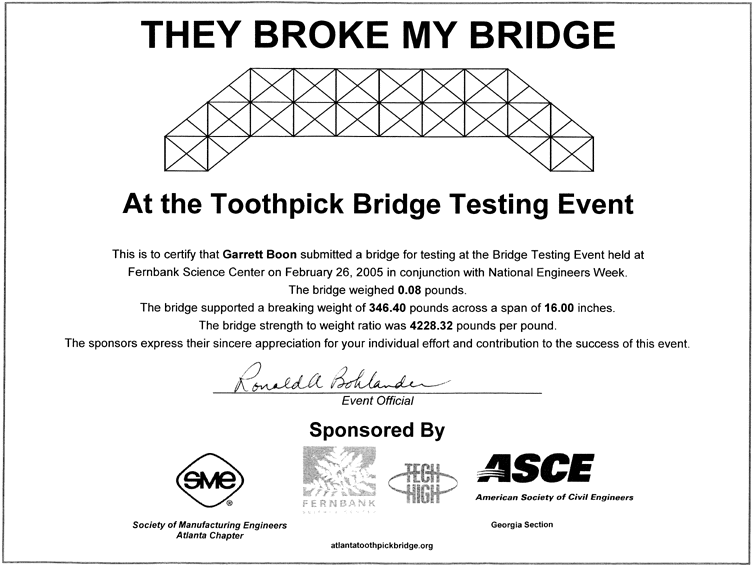 I talked to a couple engineers at the event and asked them what they thought made my bridge break. One suggested that the bridge failed in torsion, as I did not have any diagonal braces in the bridge. That is definitely a design flaw I will fix if I do this again. I would love to try and break an efficiency of 5000. That would be a strong bridge indeed! Hey Mr. Garrett, what bridge style is this bridge exactly? This one is a mix of designs. 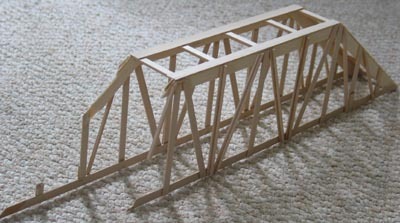 The main section is a subdivided Warren truss, while the ends use the Howe truss. Hey Mr. Garett, we have to do a cardboard bridge project in my Physics class and our teacher is incompetent and has neither given us any parameters for grading or any idea how to build it. The only thing we can use is the cardboard and Elmer’s glue. 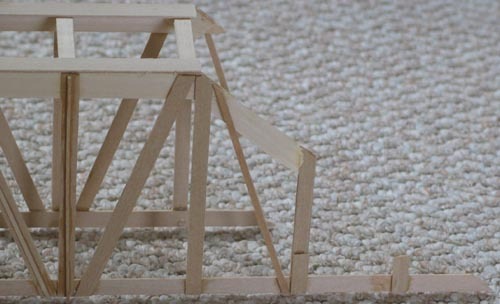 I have no idea where to start, but I saw your bridge design and if those little wood pieces can hold 346 pounds, imagine if it was in cardboard. This is just me asking a competent teacher for some help. If not, thank you for your time and I wish you the best with future bridges! Cardboard is actually much weaker than the wood on this bridge. If I were you, I would try to use corrugated cardboard, the thick kind that has extra stuff on the inside. I would also consider laminating any pieces that would be in compression, since cardboard will buckle very easily. 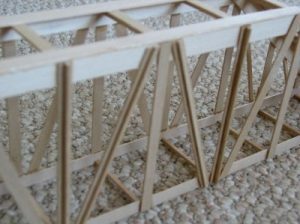 Check out my truss design page for ideas on bridge designs to use. 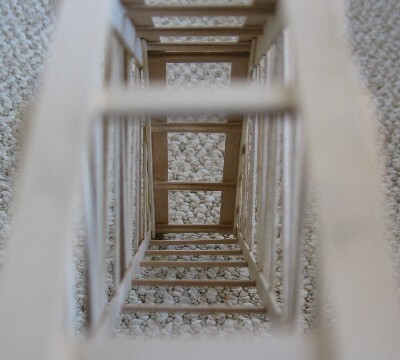 Mr. Garett Boon, thank you for posting this well-documented bridge. I am an AP Physics student, and for our final project, we are required to construct a bridge with the best strength to weight ratio possible. I understand that, based on your previous comments, you do not have any schematics or diagrams; however, I was wondering if you had any additional pictures? Anything would be helpful in our attempt, with your permission, to recreate your magnificent design. Unfortunately I do not have the plans for this bridge currently. Is it alright with you if I use this bridge design or a similar one in my school project. Keep in mind I will credit you for the design. Do I need a protractor to get exact measurements or can I just wing it? If so, what are the measurements for the angle of the trapezoid shape? I don’t have the measurements of this bridge anymore, so you will just have to wing it. Do you have a blueprint we can use to make a bridge like this one? I do not have blueprints for sale for this bridge right now. At some point in the future I hope to have them, but not currently. Hey Garrett, I’m Sam, and I was wondering what a good ratio of height to length to width ratio would be for a truss bridge, in general. If you need me to be more specific, then, as an example, let’s assume that we have a Pratt bridge that’s 25 inches long. Do you have any insight on how high or wide it should be then? I’m no expert, so just a general idea would really help me out; if you have enough time. Sam, I’ve had good success starting with a 1:6 height to length ratio. In general a wider bridge will be more stable but also adds weight. If you are testing the bridge with a load that won’t move around lateral, then a more narrow bridge is fine. But if you are planning on standing on the bridge, you probably want to make it wider. The popsicle stick bridges I make that are 25 inches long are about 3.5 inches wide. This is mostly because of the limitations from using popsicle sticks, but it does seem to work out well. If this design was used with popsicle sticks would it work? Probably, although you might have make some minor modifications. What kind of popsicle sticks did you use, just regular, or a certain kind. Also, what kind of glue? Tessa, I did not use popsicle sticks on this bridge. I used Basswood. I used two types of glue, Weldbond mostly and a little Probond. What kind of truus did you use? A howe, pratt, or warren? This bridge used a hybrid truss design. Mostly it was a Subdivided Warren, but went to the Howe Truss on the ends. what do you mean by diagonal braces? and how long did it take u? i tried to copy your design except with popsicle sticks didnt turn out very well. was kinda crooked and twisted. Good question. Diagonal bracing here refers to any pieces that would have connected the sides of the bridge on a diagonal. So if I had a piece that was glued on the bottom of the left side and sloped up to the top of the right side of the bridge. I was wondering, how was the bridge loaded? This bridge was loaded from the top with a metal plate that was attached to a hydraulic loading machine. what truss design did u use? We do bridges every year in math and they weigh under 50 g. and hold in the 1,000. my bridge held around 1,200 last year. Hey Derek, what unit is the weight that your bridges held in? I saw a bridge today at the TSA Regional conference that held OVER 496 LBS.THe bridge was made of Balsa wood and had a very strong structure. Ryan, that sounds like a sweet bridge. Do you know anything more about the bridge? How long was it etc? Do you reccommend binding the pieces? I am using bass wood, but the pieces are quite thin from my perspective. Should I glue two strips together to make it stronger? And if so, are there any parts in particular on the bridge that might not be good to do this? Yenny, this is called laminating the wood. Yes, it does make it stronger, but usually not more efficient. This means that it adds more weight than it does strength. I’d recommend you glue your strips of wood into L, T, or even I shapes which will increase their efficiency if done well. The L, T, and I beam shapes are useful for any members of your bridge that are in compression, such as the top chord. Often enough members in compression do not fail because the member itself broke, but rather because the joint failed. I would make sure you are using good joints. Hi, I have to build a balsa wood bridge for my class. I just had one question. I have decided on a Howe Truss bridge, but the slanted members that are on wither end of the roadway. How do I make them? Specifically, how do I make them angled? And strong? I know my question may not be clear, its hard to describe on words. If you do know what I am talking about, do I attach them directly to the top of the roadway? Or the side of it? Is it possible to use gusset joints on this type of bridge? Abhinav: If you make your diagonal members on the ends of the bridge connect to the bottom and top of your truss with End Joints, adding a gusset, I think that would work well. This would allow all your other joints to be natural Lap Joints. In your words, attach them to the top of the roadway. First Timer’s Second Bridge Design! 64 queries in 0.475 seconds.